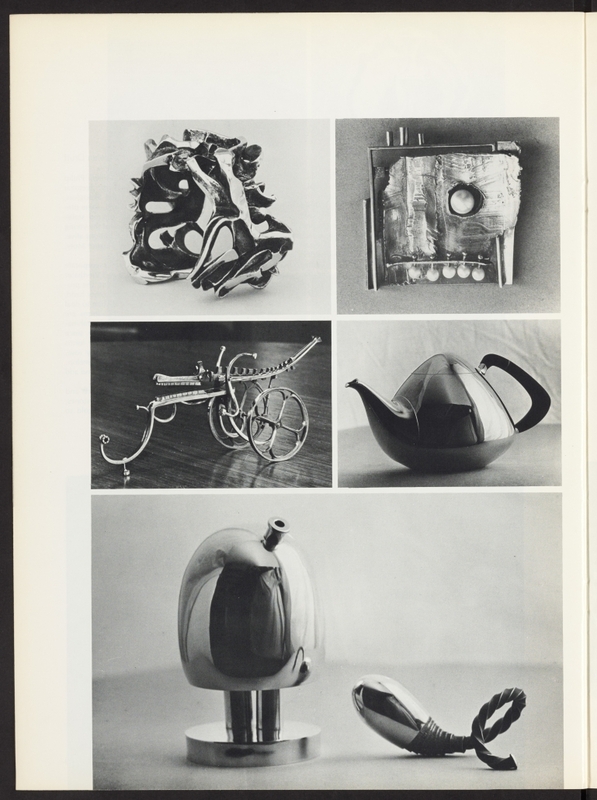 Helen Drutt, “All That Glitters: Goldsmith ’70,” Craft Horizons 30, no. 4 (August 1970): 42-45, 69. Reproduced with permission of the American Craft Council. Since 1952, the St. Paul Art Center in St. Paul, Minnesota, has held its biennial craft competition “Fiber/Clay/Metal.” Considering the acceleration in each of those mediums, the Center, now the Minnesota Museum of Art, decided to hold competitions in each medium separately, beginning this year with metal, and with fiber and clay to be concentrated upon in succeeding years. 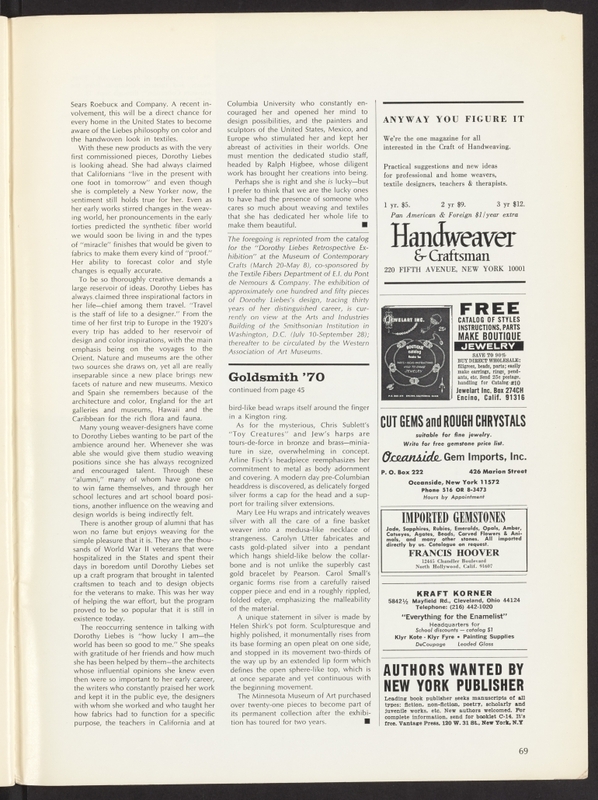 Organized by the Museum and its director, Malcolm E. Lein, the opening of “Goldsmith ’70” coincided with the Society of North American Goldsmiths’ first meeting (March 25-27), which was also held at the Museum. 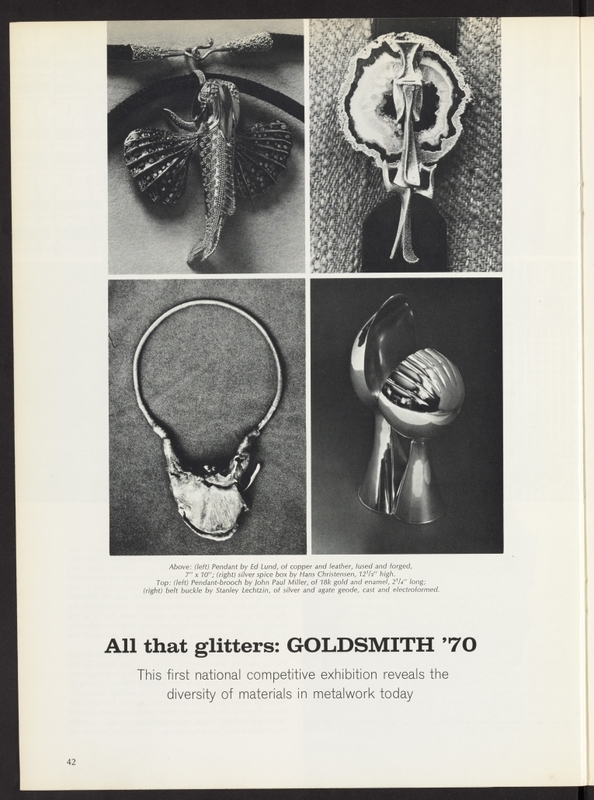 “Goldsmith ’70” represents craftsmen from Canada and the U.S., and includes an invitational exhibition by members of the Society of North American Goldsmiths in addition to the open competition. Jurors were William Woolfenden, director of the Archives of American Art, and metalworkers Stanley Lechtzin and John Prip. They selected 130 pieces by 70 craftsmen. 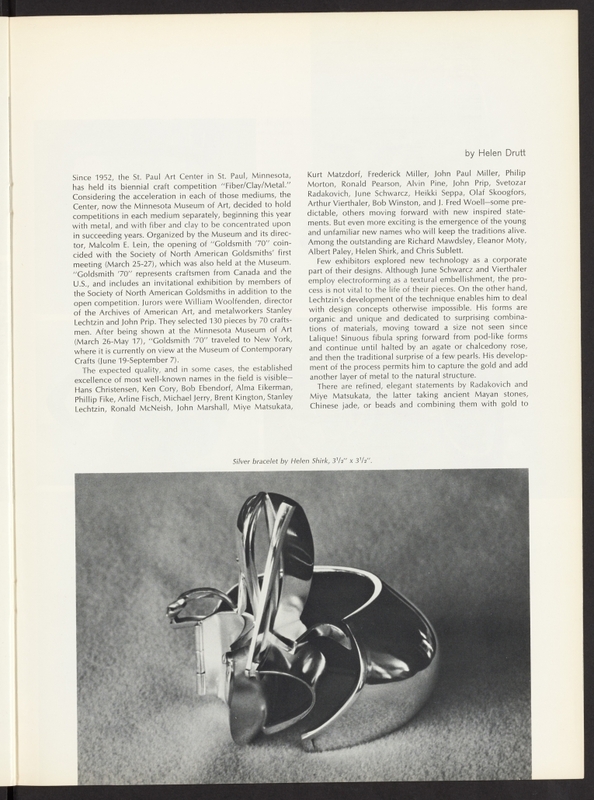 After being shown at the Minnesota Museum of Art (March 26-May 17), “Goldsmith ’70” traveled to New York, where it is currently on view at the Museum of Contemporary Crafts (June 19-September 7). 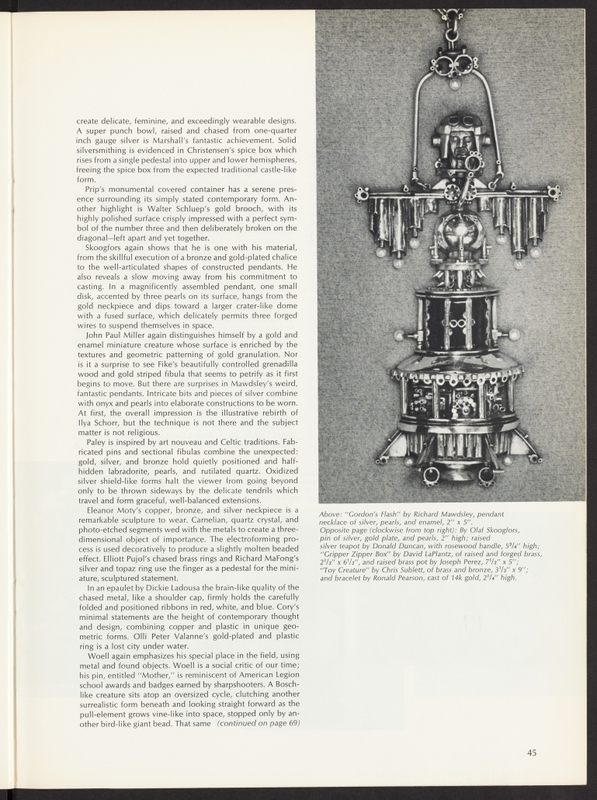 The expected quality, and in some cases, the established excellence of most well-known names in the field is visible – Hans Christensen, Ken Cory, Bob Ebendorf, Alma Eikerman, Phillip Fike, Arline Fisch, Michael Jerry, Brent Kington, Stanley Lechtzin, Ronald McNeish, John Marshall, Miye Matsukata, Kurt Matzdorf, Frederick Miller, John Paul Miller, Philip Morton, Ronald Pearson, Alvin Pine, John Prip, Svetozar Radakovich, June Schwarcz, Heikki Seppa, Olaf Skoogfors, Arthur Vierthaler, Bob Winston, and J. Fred Woell-some predictable, others moving forward with new inspired statements. But even more exciting is the emergence of the young and unfamiliar new names who will keep the traditions alive. Among the outstanding are Richard Mawdsley, Eleanor Moty, Albert Paley, Helen Shirk, and Chris Sublett. Few exhibitors explored new technology as a corporate part of their designs. Although June Schwarcz and Vierthaler employ electroforming as a textural embellishment, the process is not vital to the life of their pieces. On the other hand, Lechtzin’s development of the technique enables him to deal with design concepts otherwise impossible. His forms are organic and unique and dedicated to surprising combinations of materials, moving toward a size not seen since Lalique! Sinuous fibula spring forward from pod-like forms and continue until halted by an agate or chalcedony rose, and then the traditional surprise of a few pearls. His development of the process permits him to capture the gold and add another layer of metal to the natural structure. There are refined, elegant statements by Radakovich and Miye Matsukata, the latter taking ancient Mayan stones, Chinese jade, or beads and combining them with gold to create delicate, feminine, and exceedingly wearable designs. A super punch bowl, raised and chased from one-quarter inch gauge silver is Marshall’s fantastic achievement. Solid silversmithing is evidenced in Christensen’s spice box which rises from a single pedestal into upper and lower hemispheres, freeing the spice box from the expected traditional castle-like form. Prip’s monumental covered container has a serene presence surrounding its simply stated contemporary form. An-other highlight is Walter Schluep’s gold brooch, with its highly polished surface crisply impressed with a perfect symbol of the number three and then deliberately broken on the diagonal—left apart and yet together. Skoogfors again shows that he is one with his material, from the skillful execution of a bronze and gold-plated chalice to the well-articulated shapes of constructed pendants. He also reveals a slow moving away from his commitment to casting. In a magnificently assembled pendant, one small disk, accented by three pearls on its surface, hangs from the gold neckpiece and dips toward a larger crater-like dome with a fused surface, which delicately permits three forged wires to suspend themselves in space. John Paul Miller again distinguishes himself by a gold and enamel miniature creature whose surface is enriched by the textures and geometric patterning of gold granulation. Nor is it a surprise to see Fike’s beautifully controlled grenadilla wood and gold striped fibula that seems to petrify as it first begins to move. But there are surprises in Mawdsley’s weird, fantastic pendants. Intricate bits and pieces of silver combine with onyx and pearls into elaborate constructions to be worn. At first, the overall impression is the illustrative rebirth of llya Schorr, but the technique is not there and the subject matter is not religious. Paley is inspired by art nouveau and Celtic traditions. Fabricated pins and sectional fibulas combine the unexpected: gold, silver, and bronze hold quietly positioned and half-hidden labradorite, pearls, and rutilated quartz. Oxidized silver shield-like forms halt the viewer from going beyond only to be thrown sideways by the delicate tendrils which travel and form graceful, well-balanced extensions. Eleanor Moty’s copper, bronze, and silver neckpiece is a remarkable sculpture to wear. Carnelian, quartz crystal, and photo-etched segments wed with the metals to create a three-dimensional object of importance. The electroforming process is used decoratively to produce a slightly molten beaded effect. Elliott Pujol’s chased brass rings and Richard MaFong’s silver and topaz ring use the finger as a pedestal for the miniature, sculptured statement. In an epaulet by Dickie Ladousa the brain-like quality of the chased metal, like a shoulder cap, firmly holds the carefully folded and positioned ribbons in red, white, and blue. Cory’s minimal statements are the height of contemporary thought and design, combining copper and plastic in unique geo-metric forms. Olli Peter Valanne’s gold-plated and plastic ring is a lost city under water. Woell again emphasizes his special place in the field, using metal and found objects. Woell is a social critic of our time; his pin, entitled “Mother,” is reminiscent of American Legion school awards and badges earned by sharpshooters. A Bosch-like creature sits atop an oversized cycle, clutching another surrealistic form beneath and looking straight forward as the pull-element grows vine-like into space, stopped only by another bird-like giant bead. That same bird-like bead wraps itself around the finger in a Kington ring. As for the mysterious, Chris Sublett’s “Toy Creatures” and Jew’s harps are tours-de-force in bronze and brass—miniature in size, overwhelming in concept. Arline Fisch’s headpiece reemphasizes her commitment to metal as body adornment and covering. A modern day pre-Columbian headdress is discovered, as delicately forged silver forms a cap for the head and a support for trailing silver extensions. Mary Lee Hu wraps and intricately weaves silver with all the care of a fine basket weaver into a medusa-like necklace of strangeness. Carolyn Utter fabricates and casts gold-plated silver into a pendant which hangs shield-like below the collarbone and is not unlike the superbly cast gold bracelet by Pearson. Carol Small’s organic forms rise from a carefully raised copper piece and end in a roughly rippled, folded edge, emphasizing the malleability of the material. A unique statement in silver is made by Helen Shirk’s pot form. Sculpturesque and highly polished, it monumentally rises from its base forming an open pleat on one side, and stopped in its movement two-thirds of the way up by an extended lip form which defines the open sphere-like top, which is at once separate and yet continuous with the beginning movement. The Minnesota Museum of Art purchased over twenty-one pieces to become part of its permanent collection after the exhibition has toured for two years. http://mmaa.org/wp-content/uploads/2016/09/MMA_LogoOneColor-300x134.png 0 0 Susannah Schouweiler http://mmaa.org/wp-content/uploads/2016/09/MMA_LogoOneColor-300x134.png Susannah Schouweiler2019-04-15 18:43:062019-04-15 20:14:58Helen Drutt, "All That Glitters: Goldsmith '70"